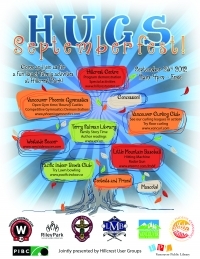 On Sunday, September 23 from 11am-4pm join the HUGS Groups for our First Annual Open House. Participating groups include Hillcrest Centre, Vancouver Phoenix Gymnastics, Terry Salman Library, Westside Soccer, Pacific Indoor Bowls Club, Vancouver Curling Club and Little Mountain Baseball. – 1-4pm – Ride the Extreme Zoom Slide, climb up on the Loopy the Dragon, join in a pirate treasure hunt, ride the Lazy River or take a swing at a pinata. Tons of fun for all ages! Regular public admission fees apply. – 12:45-2:15pm – Public skating. Regular public admission fees apply.